GNS3 Labs | CCNP | CCNA Labs: This host supports Intel VT-x but Intel VT-x is disabled. This host supports Intel VT-x but Intel VT-x is disabled. 1. Restart your PC and enter into setup/BIOS mode, for Dell PC you need to press F2 in the start for BIOS setting. 2. Once you are in BIOS, find the option of virtualization. 3. Enable it and save the setting. 4. 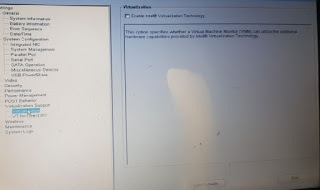 Restart your PC and try again by creating the VM in Vmware 14, this time you will successfully create your VM. "This host does not support "Intel EPT" hardware assisted MMU virtualization." This means that your processor does not support EPT virtualization but you can either use and download VMware12.5.7. This should still support the TXXXX CPU. I hope this is helpful for you, thank you for visiting.